Intel is hitting a couple of important milestones in 2018. June 8, 1978 saw the release of the Intel 8086 processor that laid solid foundation for numerous chips to come. It's no reach to say that the 8086 was the most important microprocessor in personal computing history. We're just over a month shy of another important date in electronics. Intel - originally known as Integrated Electronics - was formed on July 18, 1968, so the 50th birthday party ought to be around the corner. In typical geeky fashion, Intel is celebrating these two dates by releasing a limited-edition processor that goes by the name of Core i7-8086K. Only 50,000 units will be manufactured, of which 8,086 have been put aside for a worldwide giveaway. What the heck is the Core i7-8086K, and how does it compare to what's already out in the market? Let the table guide you. Core i7-8750K by another name? The limited edition chip is based entirely on the 8th Gen 'Coffee Lake' architecture that readers will be familiar with. In fact, it's practically identical to the Core i7-8700K that headlines the range. This means a six-core, 12-thread design, integrated UHD 630 graphics, dual-channel memory support at speeds of up to DDR4-2,666, and a 95W TDP. Obviously fitting into the same LGA1151 v2 form factor that requires a 300-series chipset, it is only frequency that is different. Core i7-8700K has a base clock of 3.7GHz, a supposed all-core clock of 4.3GHz, and through the auspice of Turbo Boost 2.0, it can boost a single thread to 4.7GHz. Core i7-8086K raises the base clock to 4.0GHz, matches the all-core clock of 4.3GHz, but is able to raise a single thread to 5.0GHz. 100MHz for each of Intel's 50 years, right. In simple terms, Intel's 14nm process is mature enough to enable effective speed-binning, and a number of Coffee Lake wafers are able to increase their single-core speed to 5GHz without undue hikes in voltage. It's these chips that are purposed into the Core i7-8086K. And that's it, folks, as this limited edition processor's sole aim is to achieve the highest consumer core frequency Intel has had to date. We know that the 5GHz barrier has been troublesome for Intel and its partners. System integrators have actually dialled down their pre-built machines' overclocks with Coffee Lake chips in situ. You are far more likely to see an overclocked, all-core speed of 4.8GHz on the Core i7-8700K, rather than the 5.0GHz seen on day-one machines. Choosing the best wafers ought to give the Core i7-8086K just a little more headroom - 100-200MHz - at the same voltage. The upshot is a probable all-core 5.0GHz for everyone, given sufficiently capable cooling. Heck, this is a Core i7-8750K by another, more interesting name. Putting all this theory to the test, we ran a retail Core i7-8086K against our press Core i7-8700K sample. Both chips are hewn from the same silicon cloth, of course, so how do they do at various voltages when cooled by a Fractal Design Celsius S24 all-in-one watercooler? This little table shows that, based on a sample of one processor per model, the Core i7-8086K is able to hit higher all-core speeds with less voltage when running the five-minute-long Blender benchmark. This length-of-time observation is important as the temperature quickly spirals as the combination of frequency, workload, and additional voltage is taken into account. In fact, the Fractal Cooler cannot stop the Core i7-8700K from throttling at 5GHz - the chip downclocks during the last minute or so of rendering - but there are no such problems for the Core i7-8086K. It's worth knowing the chip doesn't ship with a stock Intel cooler in the box. 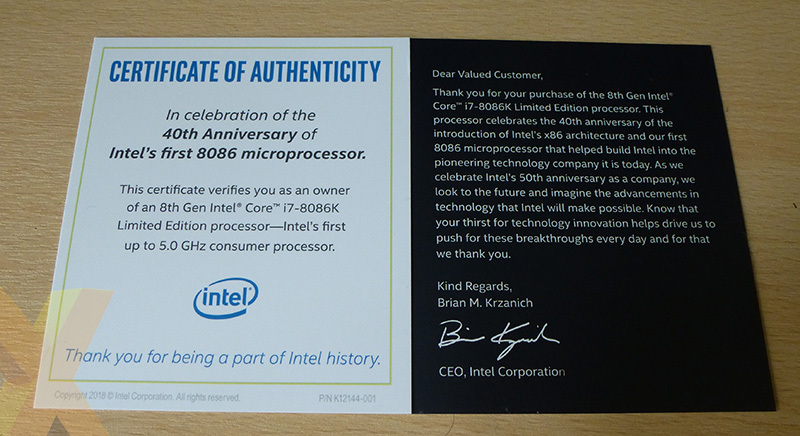 The only concession to its limited-edition status, other than the seminal name, is a certificate and note from Intel CEO, Brian Krzanich. Our testing does therefore show the newer chip to be about 100-150MHz better at the top end of the spectrum. There's no evidence of throttling at 5GHz, and given that 5.1GHz causes the occasional frequency blip as the chip hits a thermal wall, we have decided to benchmark the Core i7-8086K at both its stock speed and overclocked to an all-core 5.0GHz when sat on top of an Asus Maximum X Hero motherboard. Want to see how it all shakes out? Read on.